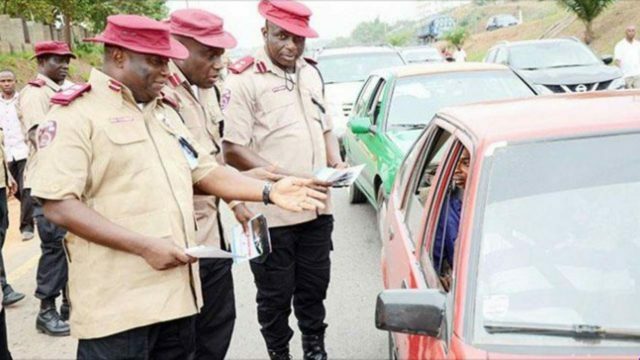 The Federal Road Safety Corps (FRSC) has warned men and officers of the corps to desist from extorting money from road users or risk being dismissed from the service. Mr Olumide Olagunju, the Zonal Commanding Officer of the corps in charge of Oyo, Ondo and Osun states, gave the warning while speaking at the 2018 First Quarter Retreat organised by Ondo State Command on Friday in Owo. The News Agency of Nigeria (NAN) reports that the theme of the retreat was: ”Towards Developing A More Effective Enforcement Initiative in Reducing Road Traffics Crashes”. “One of the organisations that has zero tolerance for corruption is the FRSC. We do a lot of internal sorting of the ”eggs” we have. “We have the good eggs and the bad eggs. We have a lot of surveillance activities where whoever is caught and proven to have extorted, will have his or her appointment terminated. The zonal commanding officer appealed to motorists to obey traffic rules and regulations and urged members of the public to support the corps in stamping out corruption on the road by reporting erring officers to the nearest command. “If you are on the road and our men are trying to extort you, give us a report of what the officer has done and be ready to defend whatever allegations you have come up with. Olagunju explained that the retreat was organised for human capacity development where strategies of operation and methods of improving service delivery are discussed. He urged officers and men of the command to re-dedicate themselves to duty and show more respect for the fundamental human rights of road users. Earlier, Mr Vincent Jack, the Ondo State Sector Commander, who was represented by Mr Olusegun Ogungbemide, Head of Operations, decried the challenges being faced by FRSC officers in the course of enforcing traffic rules and regulations. Jack said that it had become imperative to re-strategise in order to reduce the rate of road traffic crashes in the state. According to him, enforcement education, enlightenment and engineering form the major operational activities in FRSC. The sector commander, therefore, charged men and officers to come up with various ways of achieving effective enforcement and increase the corps operational activities in line with world best practices. “The corps has witnessed a lot of unbridled hostilities, unnecessary aggression and unfortunate crisis on the road while trying to arrest traffic law offenders. “This has, however, become a source of concern for the corps management team. These cankerworms must be nipped in the bud and holistically addressed before the trend goes out of hands. “Motorists have devised several means of evading arrest, and worst still, some unscrupulous elements within the corps have descended so low as to compromise the enforcement processes. “It is, therefore, very imperative at this juncture to evaluate how enforcement is being carried out in the past, how we are doing it now and plan on how to improve on it. “This is expected to be the major focus of this retreat,” Jack said. Furthermore, Hon.Ganiyu Omoluka, the Caretaker Chairman of Owo Local Government Area, attributed some of road crashes recorded in the country to lack of respect for traffic rules and regulations. Omoluka, who decried the nonchalant attitude of most drivers to traffic rules, admonished them to avoid speeding and overloading and also undertake necessary checks on their vehicles before embarking on any journey. According to him, bad roads alone cannot be viewed as the major cause of road crashes; we need to shun the habit of drinking while driving.